Finally, a big thank you to all the local people who contributed so much to monitoring nests in 2015, including those from the farming and fishing community who really do value these magnificent birds and have seen first-hand that eagles and farming can co-exist in a benign way. Communities in Glengarriff, Killarney and Mountshannon have also seen the potential for the birds to enthral both locals and tourists alike and hopefully this will be the case for many years to come. As in 2014 the Bird Viewing & Information Point at Mountshannon, Co. Clare, is open every day on Mountshannon pier where Mountshannon Community Council and Clare Co. Co. have provided local people to man the facility and show visitors the nesting eagles. National Parks & Wildlife Service has also played an important role especially in Glengarriff and Beara….take a bow Clare Heardman at Glengarriff Nature Reserve:-). And to Damian Clarke (Wicklow Mts Nat Park) for this tree climbing expertise! 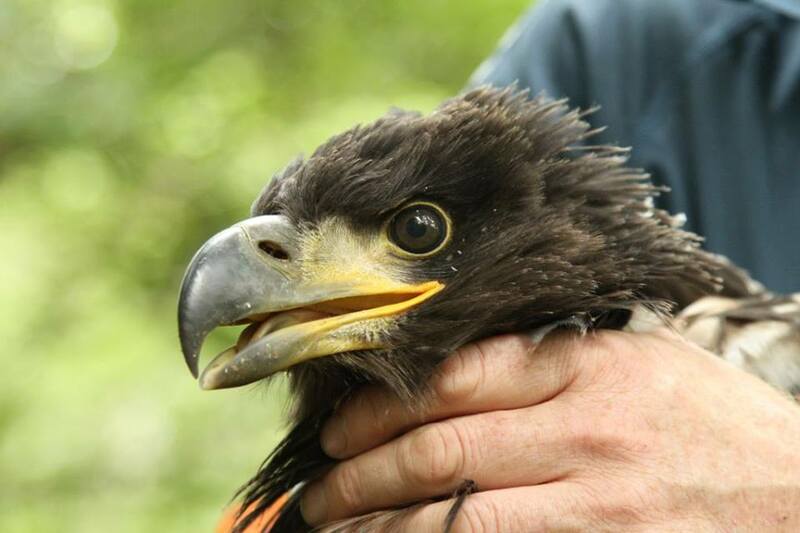 Over the next few months look out for updates on our young eagles, especially Cealtra, the young satellite tagged female Sea Eagle which left her nest near Mountshannon in July! Thanks to Clare Heardman and Alan MacCarthy for the pics.